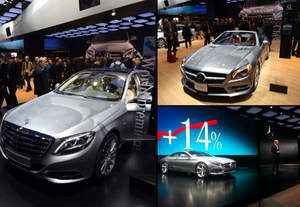 DETROIT, MI--(Marketwired - Jan 13, 2014) - North American International Auto Show - (NASDAQ: REFR) At their press conference this morning at the Detroit Auto Show, Daimler AG showed for the first time at any international auto show the production version of the S600 V12, their flagship S-Class. This model as well and other new variants of the S-Class which begin to come out later this year, will offer a panoramic roof with the instantly dimming MAGIC SKY CONTROL feature which uses Research Frontiers' SPD-SmartGlass technology. The MAGIC SKY CONTROL feature uses patented SPD-SmartGlass technology developed by Research Frontiers to turn the roof transparent by electrically aligning tiny particles in a thin film within the glass. With the touch of a button, drivers and passengers can instantly change the tint of their roof to help keep out harsh sunlight and heat, and create an open-air feeling even when the sunroof is closed. Glass or plastic using Research Frontiers' patented SPD-SmartGlass technology effectively blocks UV and infrared rays in either mode, helping keep the cabin cooler, and protecting passengers and interiors. These benefits become even more important when a car uses large surface areas of glass, such as the panoramic roofs on the new S-Class. Joseph M. Harary, President and CEO of Research Frontiers noted from the floor of the Detroit Auto Show: "The S-Class will use approximately three times as much roof glass as the current SL and SLK roadsters, and this, along with the higher projected production volumes and take rates, should result in significantly higher visibility for our SPD-SmartGlass as well as higher royalty income to Research Frontiers starting this year. The introduction on the S-Class is also significant in that it moves our technology from roadsters to the higher volume market for sedans." In a tribute to its roots, proudly sitting next to the flagship S600 on the display floor of the Detroit Auto Show was Mercedes' flagship SL roadster equipped with MAGIC SKY CONTROL. Daimler was the first automotive OEM to introduce SPD-SmartGlass technology into a serial production vehicle with the introduction in 2011 of the Mercedes-Benz SLK. This innovative feature was then introduced by Daimler in their flagship Mercedes-Benz SL roaster in 2012, and in August 2013 it was announced that the MAGIC SKY CONTROL feature would be in the new S-Class. At the Frankfurt Auto Show in September 2013, the new S-Class Coupe concept (the successor to the Mercedes-Benz CL) was unveiled which will have the largest single piece of SPD-SmartGlass roof ever put into serial production. Now with the S600 and the other S-Class variants which use two large pieces of roof glass, the total roof glass area will be even larger in total surface area. From the Arctic Circle to Death Valley to the floor of the auto show, dealer showrooms and on the road, SPD-Smart technology has proven itself in many aspects, from durability and performance to sales. MAGIC SKY CONTROL is now in use on thousands of SL's and SLK's around the world. Before putting cars into serial production, Mercedes-Benz put the MAGIC SKY CONTROL roof using SPD-SmartGlass technology through rigorous durability and performance testing in some of the most extreme conditions on Earth. This included testing in the arctic cold of Scandinavia (with temperatures below -22ºF/-30ºC) and the blistering desert heat of Death Valley, California (with temperatures exceeding 122ºF/50ºC). The MAGIC SKY CONTROL feature using patented SPD-Smart light-control technology allows drivers many benefits including the ability to create the open-air feeling of a roadster. It also blocks over 99% of harmful UV radiation and substantially reduces heat inside the vehicle. Test data published by Mercedes-Benz shows the ability of the roof to reduce sun exposure to 1/20th of direct exposure levels (from over 1,000 watts/square meter to less than 50 watts/square meter). When compared to conventional automotive glass, Mercedes-Benz reported that the use of SPD-SmartGlass significantly reduces the temperature inside the vehicle by up to 18ºF/10ºC. This increases passenger comfort and reduces air conditioning loads, thereby saving fuel and reducing CO2 emissions. Historically, since its debut over 40 years ago, the S-Class represents the premier platform to introduce new technologies to the customer, which in many cases expand to the other model lines within the Mercedes-Benz brand. In addition to being a proving ground for innovations in the automotive industry, the S-Class also provides solid profits for Daimler. Last year, Automotive News reported deliveries of 80,300 S-Class vehicles, compared with 59,200 BMW 7-Series and 38,600 Audi A8s, both of which are competitive vehicles to the S-Class in the marketplace. Research Frontiers is the developer of SPD-Smart light-control technology which allows users to instantly, precisely and uniformly control the shading of glass or plastic, either manually or automatically. Research Frontiers has built an infrastructure of over 40 licensed companies that collectively are capable of serving the growing global demand for smart glass products in automobiles, homes, buildings, museums, aircraft and boats. For more information, please visit our website at www.SmartGlass.com. Note: From time to time Research Frontiers may issue forward-looking statements which involve risks and uncertainties. This press release contains forward-looking statements. Actual results could differ and are not guaranteed. Any forward-looking statements should be considered accordingly. "SPD-Smart" and "SPD-SmartGlass" are trademarks of Research Frontiers Inc. MAGIC SKY CONTROL, Mercedes-Benz, and model designations SLK, SL, S600, and S-Class are trademarks of Daimler A.G.
About this company Research Frontiers, Inc.
Mercedes-Benz S-Class S600 and Coupe, and SL Roadster with MAGIC SKY CONTROL using SPD-SmartGlass technology at the North American International Auto Show in Detroit.